Excellent piece of investigative journalism on the part of Ms. Beeley, we owe her a debt of gratitude for exposing the lies our western governments are telling us. The Syrian people are suffering under the ‘moderate rebels’ and ‘opposition forces’ backed by the US, NATO member states and their allies in the Gulf states and Israel. Yet their suffering is largely ignored in the mainstream media unless it furthers the agenda dictated by the State Department. 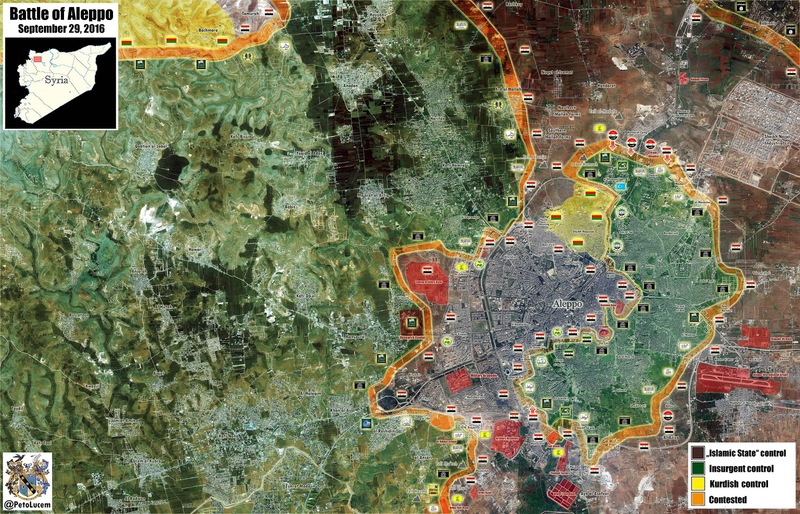 Editor’s Note: This article is the first in a two-part series of one Western journalist’s journey to Aleppo, a city ravaged by an insurgency supported by the United States, NATO member states, and their allies in the Gulf states and Israel. 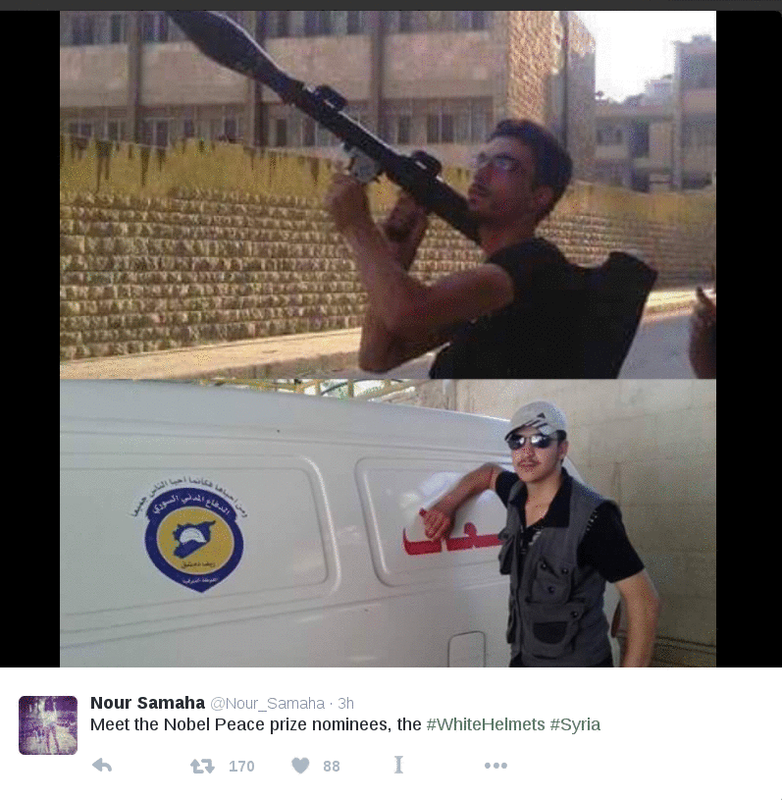 .In Part I, Vanessa Beeley lays out the mainstream narrative on Syria, revealing a neoconservative agenda promoted by NATO-funded NGOs. These NGOs paint the destruction of the historic city as being caused by the Syrian government under Bashar Assad, not the violent armed insurgents which receive arms, funding and training from Western governments and their allies. ALEPPO, Syria — Aleppo has become synonymous with destruction and “Syrian state-generated” violence among those whose perception of the situation in the war-torn nation is contained within the prism of mainstream media narratives.The NATO-aligned media maintains a tight grip on information coming out of this beleaguered city, ensuring that whatever comes out is tailored to meet State Department requirements and advocacy for regime change. The propaganda mill churns out familiar tales of chemical weapons, siege, starvation and bombs targeting civilians–all of which are attributed to the Syrian government and military, with little variation on this theme.The purpose of this photo essay and my journey to Aleppo on Aug. 14 was to discover for myself as a Western journalist the truth behind the major storylines in the U.S. and NATO narrative on Syria. I'm going to shamelessly post what she writes about the trip, from her Youtube channel, as she's an important source of information regarding this civil war. "Travelling with a fellow independent journalist, Eva Bartlett, a translator and a taxi driver, I entered Aleppo on Aug. 14 via Castello Road, which some mainstream media have taken to calling “Death Road.” To get there, we were given a security clearance which enabled us to travel via roads that, from the western city of Homs onward, snake through areas where various terrorist groups, including Daesh, are never far from the route or where the threat of kidnapping is to be taken into account. 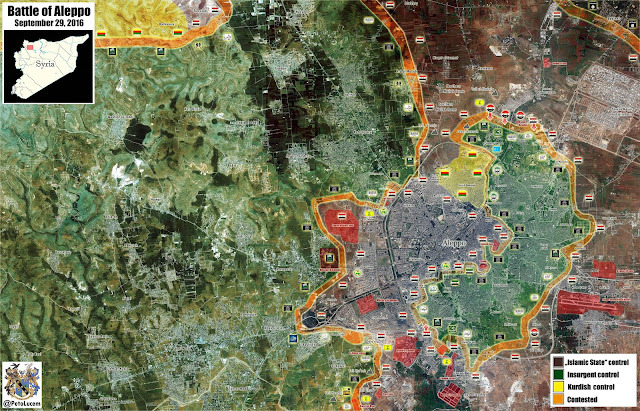 Entry into military areas once inside Aleppo could not be approved without SAA protection and accompaniment. In Homs I witnessed what is a familiar sight throughout Syria: buildings scarred and battered by years of terrorist attacks. I was told that we were passing what was once known as 60th Street, but has since taken a new name, Street of Death (Shara al-Moot), as it came under terrorist attack from north, south, east and west. These attacks employed snipers, mortars and suicide bombers; it seems there were no restrictions on ways for terrorists to kill the Syrian people in Homs. Traveling north on the road from Homs to Hama, we came to a major SAA checkpoint at a crossroads teeming with life. Waiting for the inevitable security check, I had the opportunity to lean out of the taxi window and observe. Photography, however, is forbidden at checkpoints. Read more at Mint Press:"
From R&U Videos who put together wonderful compilations with translated text on this civil war in the Syrian Arab Republic. As the video mentions, it's interesting how these rebels, who are supposedly under a tight siege, can't get food in, but are able to receive new advanced weaponry and ammunition. MAP UPDATE: Syrian Arab Army and Palestinian Liwaa Al-Quds captured Handarat and Kindi Hospital in northern Aleppo Province. Canada opened its doors in 2016 to Syrian Refugees. Thankfully they appear to have been carefully screened (we're learning from past lessons). If I remember correctly the first batch were Syrian Christians, so not much worry in terms of terrorism there. Subsequent batches have been seen wearing the hijab, but that in itself is alright - It's not a sign of being a conservative takfiri. The takfiri can stay where they are as far as I'm concerned. The video should be a good watch. Kirkuk Reported to be Forcing Returns of IDPs without Explanation as Conditions in Hawija Worsen According to the UNHCR, officials in Kirkuk have pressed nearly 8,000 IDPs to depart the province since the beginning of September--allegations that the Kirkuk Provincial Council denies. At least 30 of these expelled families are living on the outskirts of farming villages north of Baquba in Diyala Province without access to adequate food, water, or medical care. The reason for the expulsions is under investigation after an agreement was reached between a Parliamentary Delegation and the Governor of Kirkuk, Najmaddin Karim, to allow the continued presence of IDPs in Kirkuk until the end of the year. Meanwhile, Iraqi Security Forces remain hesitant to clear Hawija (a city of about 100 thousand in Kirkuk Province) of ISIS militants despite deteriorating humanitarian conditions. ISIS Increases Restrictions in Mosul as Joint Forces Continue Preparations ISIS militants in Mosul are retaliating against citizens in the city for increased incidents of civil resistance and losses of supply routes that have heavily impacted the so-called Islamic State’s finances. According to sources in Ninewa Province, ISIS has imposed increased taxes on residents, has banned women from wearing veils in certain parts of the city out of concern for militant safety, and is blocking streets with concrete barriers and planting IEDs to slow the advancement of security forces ahead of impending operations to clear the city. On September 28, U.S. Secretary of Defense Ashton Carter announced that the United States will send 600 more troops to Iraq to “train and advise” Iraqi Security Forces during their preparations, bringing the total count of U.S. troops in the country to 5,262. Baghdad Sees an Uptick in Crime and Violence Iraqi Security Forces remain overextended as they concentrate efforts to clear Mosul of ISIS militants. The focus has resulted in an uptick of violent crime, IEDs, suicide bombings, and theft in Baghdad where the security situation remains tenuous at best. See below for a readout of major crimes that have occurred in the city over the past week and a map of IED incidents across Iraq since September 23. This well written story appeared on Antiwar.com recently - In my opinion they do good journalism over there. "It’s the timing that should amaze us (were anyone to think about it for 30 seconds). Let’s start with the conflict in Afghanistan, now regularly described as the longest war in American history. It began on October 7, 2001, and will soon reach its 15th “anniversary.” Think of it as the stepchild of America’s first Afghan War (against the Soviets), a largely CIA affair which lasted from 1979 to 1989. Considered a major victory, leading as it did to the implosion of the Soviet Union in 1991, it also devastated Afghanistan and created close to the full cast of characters for America’s second Afghan War. In reality, you could say that Washington has conducted a quarter-century-plus of warfare there (with a decade off). And in the Pentagon, they’re already talking about that war’s possible extension well into the 2020s." 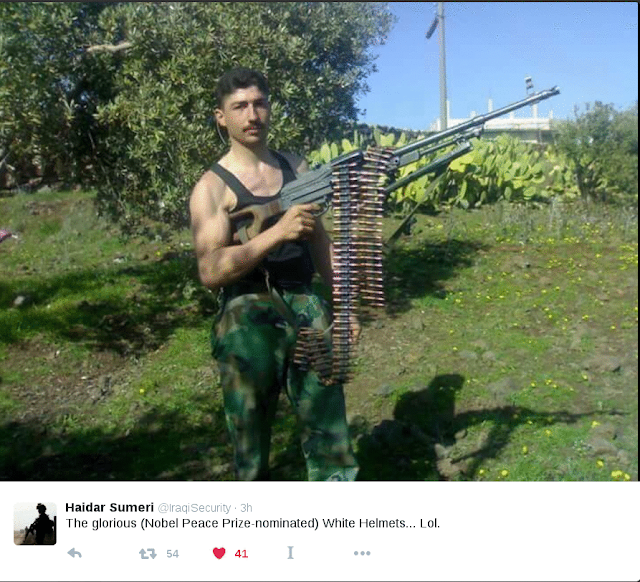 Finally someone in the West telling us that he realizes what is going on! The UK needs to elect this man. On the heels of the US threatening to arm the Al-Nusra and their comrades with ManPads the US people should know the truth. I wonder how many Americans realize that the majority of Aleppo-ians while probably not rabid supporters of Assad, were happy with the status quo and didn't rise of against the government in Damascus - The majority of the Islamist Militants fighting in Aleppo are from outside the city. The majority of Aleppo citizens that were in the east, living, migrated to West Aleppo, which the militants shell frequently with their notorious inaccurate Hell Canons! But we in the West, don't hear of this, in our media. 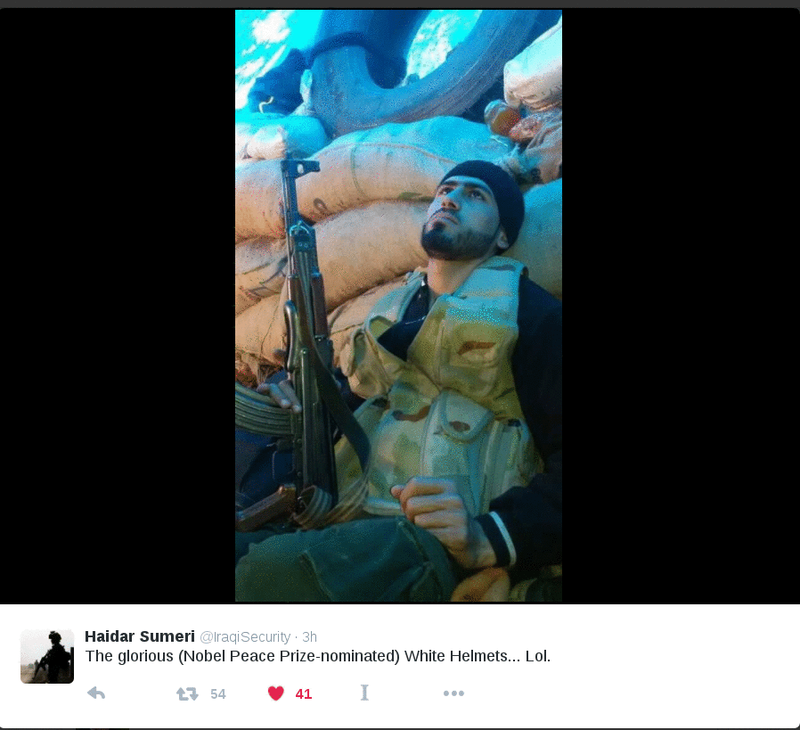 Al-Nusra Commander "The Americans stand on our side"
Syria's Fragile Truce: Can It Last a Week? According to this report on RT English. Very worrying is the message that the US is conveying to the world, via John Kerry. Looks like the US wants to escalate the civil war and still want to depose the legal government of Bashar Assad. 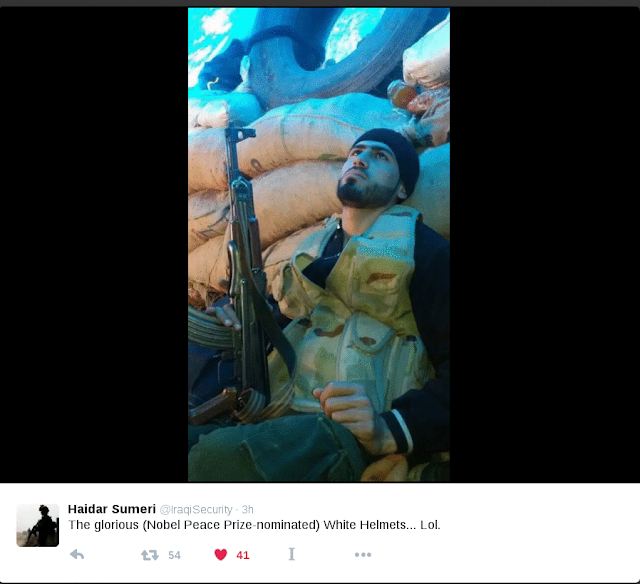 The US is the invader once more on Muslim lands, and Al-Nusra seems happy with that?! Syria's White Helmets - Who Are They Really? 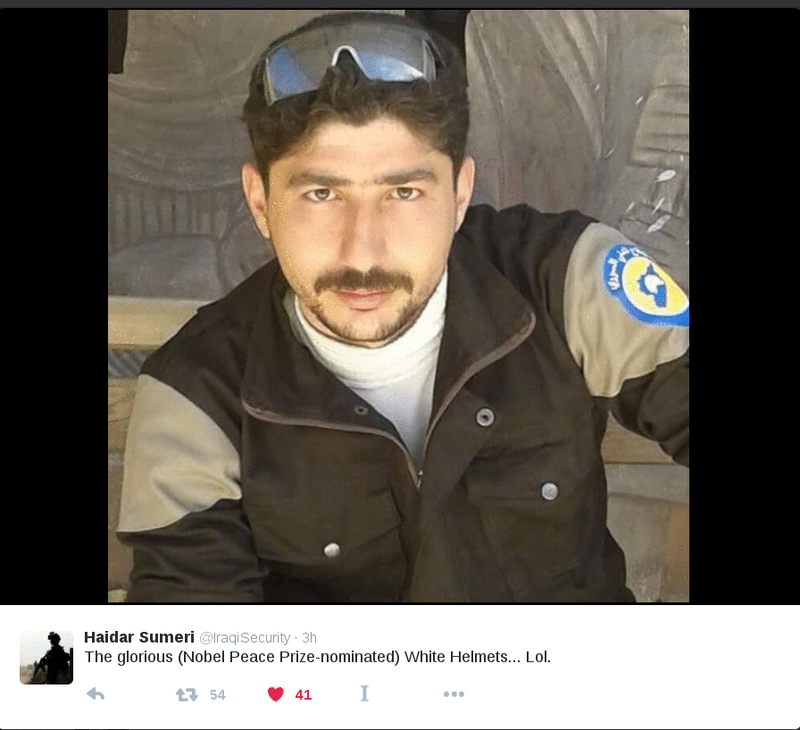 Lately there has been controversy on the "White Helmets" - especially when it was announced that they had been nominated for a Nobel Peace Prize. Twitter and other social media erupted with both pro and con messages towards this group. This is on the heels of the leader of the White Helmets being refused entry into the United States - with the latter being coy on the reasons he wasn't allowed into the United States. Even in my country Canada, the NDP federal party has pushed for them to be honored at the Nobel Party. I'm sure the NDP is well meaning if not hopelessly naive - they obviously haven't done their research into the civil war that's been going on in Syria for 5 years - Something that occurs often these days in the west, unfortunately. Some of us - myself included have been saying that this group isn't who they say they are: "Unarmed and Neutral" as per this screenshot from their web site. In fact there is plenty of evidence around for those that are serious to discover that they are a propaganda operation funded by the USA and UK. 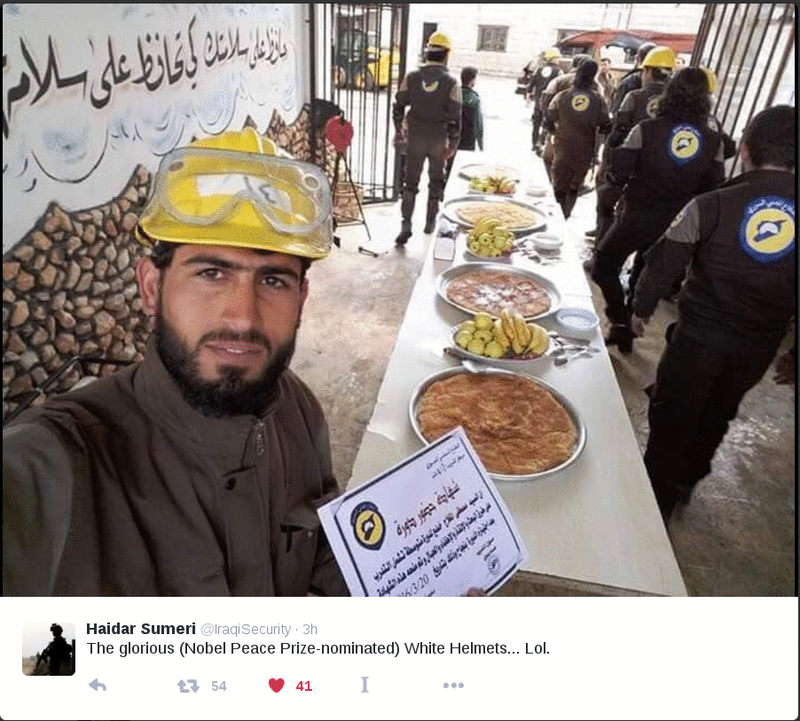 I have included some screenshots from my Twitter feed which show "White Helmet" volunteers, who apparently don't follow the unarmed and neutral mission statement. 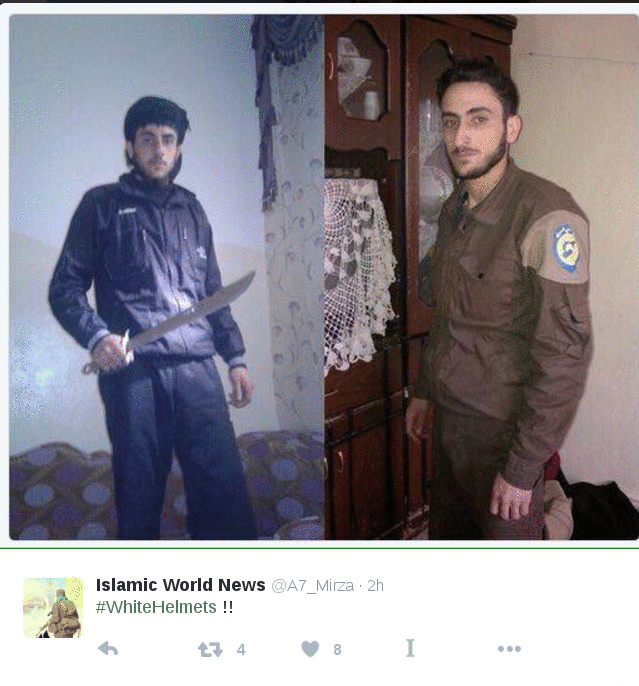 From what I understand, this is pretty much widespread, as these White Helmets, only work in Al-Nusra or ISIS held areas. We've also seen video footage of them waiting on the sidelines while Islamic extremists, execute regime soldiers or civilians, and then appear instantly in the video frame to remove the bodies. Seems they are working hand in hand with the terrorists! So, you the reader shall make up his/her mind about this group.